Is there a real-time signal strength meter yet? And if not, why not? Is it time to switch to a more responsive company? This is an absolutely essential feature. How else can you possibly tune your antenna??? Trial and error and a time consuming rescan (where you may lose other channels) is not an option. Cord cutting is never an easy plug and play that’s what cable and satellite for if you have a problem they come to your home and fix it. I haven’t found a device, other than a hand-held telecom technician tool, that does real-time signal strength measurements. And those cost more than the Tablo. None of my TVs do real-time signal measurement in a meaningful manner. The Hauppauge tuner I had way back in the analog days didn’t either. If you can find something for $50 or less, please let me know. I would like to be able to fine-tune antenna position also. If you can find something for $50 or less, please let me know. 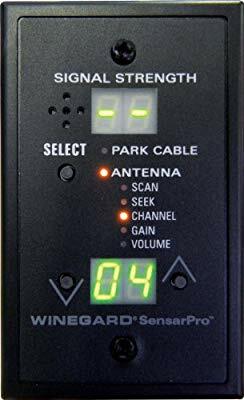 Winegard SensarPro was designed to be installed in an RV, and connected to the RV’s 12V power source. 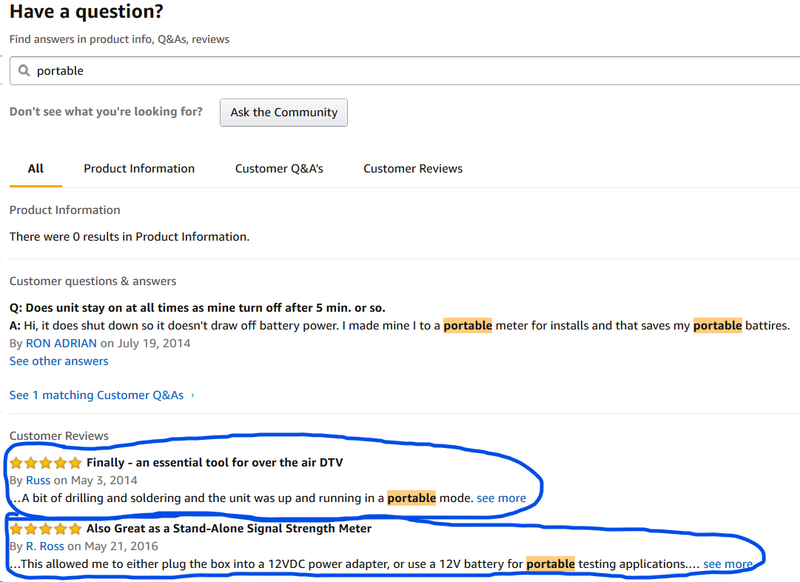 However, a couple Amazon customers posted reviews, including how to make the unit portable. My 2018 Sony has a real time signal meter. It displays virtual channel number, real channel number, frequency within the channel. And every 5 seconds it displays signal strength, sound to noise ratio, and errors. I’m not quite sure that straight forward. Although tablo doesn’t work with antenna rotors TV Antenna Setup: How to Access OTA Signals from Multiple Directions. Cord cutting in general, with a TV and an antenna on a rotor - scan for channels, the TV has “meter” for signal strength. Rotate the antenna and scan for some more, depending where you live, repeater It’s always been relatively that easy. Maybe they need to know which direction gets the most channels from a fixed position for the tablo. A TV meter that only displays signal strength is often of little or no help. What is also needed is the sound to noise ratio and the number of uncorrectable errors over a given time. You can have a relatively high signal strength but a low sound to noise ratio. This results errors and thus pixelation and weak signal situations. Whereas thousands of others (millions?) have had no serious problems in this arena, you might be a good candidate for (as you put it), “a more responsive company”. That’s a premium product and those are excellent features! Yes, I think the TV “meter” is mostly a “feel good” thing. Signal strength and signal quality percentage has little technical meaning… but consumers feel good seeing some gauge moving. Then again, it does have a minimum usefulness when adjusting an antenna. Since ben1 is just being a troll, I’ll pose the question to the rest of you. Since this is a basic and in my opinion, essential feature, I wonder why they don’t have it after all the requests? It is one of the top requests I can see based on web searching and I would imagine one of their most time consuming support issues. The argument that plenty of people have lasted this long without it is a fallacious argument. Most people are just not technical and don’t know better for one. Also, many people may live close to strong signals or only need it the first time they set things up unless they buy a new antenna. Still others just live with it. If they get the 3 channels they watch the most, that’s acceptable to them. I am in a marginal area despite living in a suburb of a metropolitan area, due to stations being spread out in multiple directions and relatively far. Topography, weather and foliage can be an issue. Assuming there isn’t interference in the band you are using, the noise level would be pretty low, so you can focus just on signal strength coming out of the antenna and feed line. If the signal is -50 to -60 dBm, I should be able to receive that channel. If not, then the problem lies elsewhere. If I have 30 dB (not dBm in this case) between the signal and the noise, that should be enough. Certainly the unit has the capability to report this since it does so during the scan. So why not expose that in real time on screen or report it to the app? The KB states that the “dots” displayed during a channel scan use an algorithm based on the bit error rate and the packet error rate. That is better than nothing. Why not give that to us? I may just buy an hdhomerun for $50 on ebay and use it to adjust the antenna. Overall I am happy with the Tablo, this and not having a free way to set a recording remotely are my only real issues. Since this is a basic and in my opinion, essential feature, I wonder why they don’t have it after all the requests? First, the current system works well for most users. It’s simple and shows you what you can and cannot get with the current antenna placement. Adding more complexity could make it harder to use. Second, it would require a major UI change, which would mean changing the Roku app, the AppleTV app, the web app, etc. One of the weaknesses of the Tablo is that any UI change, even one that appears minor, requires quite a bit of work to update all the apps. Third, there are other ways to check the signal strength, by buying products shown in this thread or even hooking up your antenna to the tv directly and scanning. There are many ways to set recordings remotely for free if you don’t want to pay for the Tablo subscription. You can run a VPN server on a computer or your router at home where the TV is setup. Then you can VPN in whenever you want and your phone or tablet will be able to connect to the Tablo “locally”. This would also allow remote pairing of devices. Take what I say with humor in mind. Maybe, but he’s a funny one. Rephrase the statement to “I need this feature, because I can’t use the product without it”, and you’ll get a lot less flames. I’ve got kids looking over my shoulder. Don’t make me look up words that are riskly close to embarassing ones. Most people are just not technical and don’t know better for one. I agree, and ignorance is bliss. I’m much more stressed out knowing what I know. Also, many people may live close to strong signals or only need it the first time they set things up unless they buy a new antenna. Still others just live with it. If they get the 3 channels they watch the most, that’s acceptable to them. Last time I told Microsoft they were doing it wrong, well, still waiting to hear back. I would be interested if anyone has used this small digital device. Unless I am wrong, it looks like it can determine the signal strength per channel. It’s around $40. 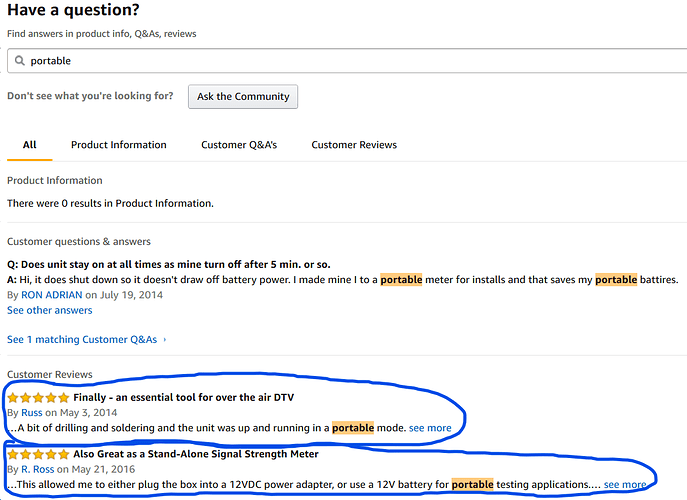 There’s only one review for it on Amazon, and it’s not a good one. Since this is a basic and in my opinion, essential feature, I wonder why they don’t have it after all the requests? It is one of the top requests I can see based on web searching and I would imagine one of their most time consuming support issues. Here’s an entire list, in this community forum, no web searching, Feature Requests. Virtually every topic has been insisted as crucially critical… and it’s unimaginable why they haven’t gotten around to it yet! You most likely give the general public too much credit. I would suspect much of the support questions would seem ridiculous to many with a bit of a technical background. What you may consider common sense, may not be so common to others. This is the second incantation of the forum. The original forum had a huge list of feature requests and who knows if it migrated to the current forum. The original forum had a huge list of feature requests and who knows if it migrated to the current forum. They’re gone along with my Myspace songs.